Ropes beating masts, seamen shouting, the sound of trucks at the log mill and the foundry. The women striking a bargain at the fish market, children and their hoops and dogs running after them, barking and squealing as they are kicked by the boys. The sound of arguments outside the Patent Vaults as the drunkards fight over a woman or a card game gone awry. By now only the sound of ropes still exists at Victoria Dock. Sound is a very common thing and each town is full of sounds. Caernarfon is no different to any other nautical town, judging from the sounds above, but there is a big difference here. If you go back a few centuries the native people would have heard the sound of the Roman Legion nearing the Seiont and upwards to what became the Segontium fort. The olden people in their small fort at the top of Twtil would be astounded by the sight of a long line of foreign solders arriving, but it's relatively certain that they would have heard of the attack on Anglesey and the destruction of the Derwyddon across the Menai. In the 13th century there would have been completely unfamiliar sounds echoing through the area as thousands of workers raised the walls of the Norman town, and the giant castle on the shores of the Menai and the Seiont. 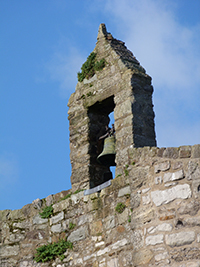 The sound of men straining to lift stones in order to build the walls to defend the town and the castle would be heard for years and would have struck the people of Caernarfon as the death knell of the House of Gwynedd. 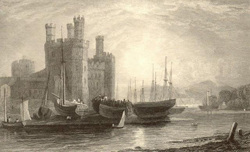 Owain Glyndŵr’s attack on Caernarfon in the early 15th centuary was not successful despite the fact that he and his soldiers kept the town under seige for many weeks, however there was the sounds of Rhys Gethin commanding his men to try anything to get entrance to the town. Glyndŵr failed to take Caernarfon but Madog ap Llywelyn did in 1297. During the English Civil War between 1642-1651 the sound of buildings being demolished could be heard along the streets of the town and several buildings were torn down in the area of Llanover Street and Boot Street by Colonel Bryon, in order to defend the castle from Cromwell’s army. As these old streets disappeared, we lost one of the oldest thatched roof houses in the town and the sound of destruction and burning could be heard. 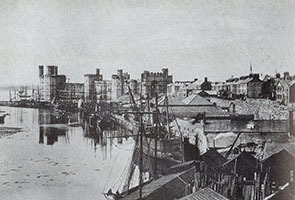 Caernarfon was one of the most important ports in the land to send slate to every corner of the world, and one could hear the sound of slate ships in the Quay and workers in the Harbours creating ropes, anchors and all sorts of goods for the ships that were being built in Victoria Dock with the slate arriving in horse drawn trucks from Nantlle and then by the much noisier train. The people of Brynsiencyn would cross on the ferry to work in the shops, send their children to school and bring their goods to the market on the Square and then went home with their purchases and said their farewells to friends and lovers by the river. If you listen carefully to the language of the people of Brynsiencyn today, traces of the Cofi accent can still be heard in there somewhere! You could hear the sound of a bell ringing to anounce that a prisoner will be hanged in the Hanging Tower, and the crowd rushing to see the act and treating the event as a reason for a party! Very different sounds could be heard on the streets of Caernarfon in the 19th century. The Crier announcing from the town centre that the Mayor would be holding a fair in the Market, although 'Lloft yr Hol' is what the Cofis called the market at that time. The cry that Betsan and Robin from Tref Gof had been burned to death in their impoverished home. The sounds of Bob Robin shouting from the stocks after he was caught up to no good whilst drunk once again! At the market you would hear the horses, cattle, the trolleys, children playing, gypsies shouting, drunkards arguing, preachers chiding, councillors talking courteously in order to get a vote in the next weeks' election, Stromboli the strong man challenging anyone to step into the ring and then lifting a man on each arm. Big Martha, asking people to guess how much she weighed but no one brought scales to find the correct weight! It is the people who are the essence of any town, with their shouting, laughing, arguing, chiding, loving and crying, and the people of Caernarfon have been creating this essence for centuries. Now, cars and buses, the steam train, seagulls, (always the seagulls), an ambulance on its way to Ysbyty Gwynedd, singing on a rubgy game weekend, Mansell Davies lorries; but on the quay the ropes on the boats are still striking the masts, exactly as they were a hundred and fifty years ago.